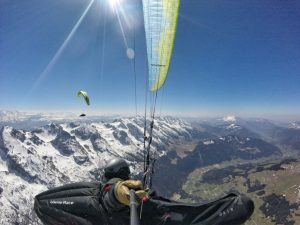 Paragliding private course, check the offers! Paragliding private course, cross country coaching. The service I offer is a tailor-made paragliding private course. Expect the price to be a bit higher than for conventional collective courses. My pricing depends on how many people take part and the retrieve service you wish. Those a prices include my full day service, the transportation from your place of stay to the take off point and all the pictures taken during the course. To enjoy the full retrieve service for 1,2 or 3 persons , add 100€ per day. One driver is following us all day. This option is not mandatory somebody you choose can be driving for us if not I warmly recommend to take that option. It gives us much more flexibility on the flight plan as we don’t have to come back at the take off place. To enjoy the full retrieve service for 4 or 5 persons, add 150€ per day. For more than 5 people it’s much better to have a second instructor, So the following price include the service of 2 instructors. To enjoy the full retrieve service for 6, or 7 persons, add 100€ per day. To valid a booking I always ask for 50% of the whole amount of deposit. You can pay it by bank transfer or by Paypal. The deposit is always refund if I personally have to cancel the course due to bad weather or for other reasons or if you cancel more than 30 days before the start of the course. I keep it in case you cancel less than 30 days before the start of the course. To book please check my availability and fill the form on that page.